Campbell Scientific now offers the ZephIR 300, a continuous-wave, remote sensing LiDAR system. 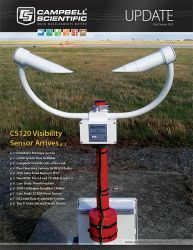 It provides wind measurements across ten user-defined heights from 10 m to 200 m. The ZephIR 300 can be used throughout the life cycle of a wind project, including site prospecting, wind-flow model verification, power-curve assessment, permanent wind-farm anemometry, and operational wind-farm analysis. Continuous-wave technology offers unique benefits for the wind industry. One benefit is the ability to provide fast sample rates (50 data points per second across a full 360° scan). This is especially advantageous for complex and rapidly changing air flows. Another benefit is the ability to make accurate measurements across the entire wind turbine rotor diameter, down to just 10 m above ground level. The ZephIR 300 provides a wind speed accuracy of better than 0.5% as measured against a calibrated moving target, and a wind direction accuracy of better than 0.5°. The ZephIR 300 uses an infrared beam to illuminate natural atmospheric aerosols such as dust, pollen, or water droplets. When the infrared beam hits these aerosols, some light is backscattered into a receiver. Wind affects the motion of these aerosols, and changes the backscattered light’s frequency. This frequency shift is measured by a photo-detector, and from these measurements, wind speed and direction are calculated. To ensure accurate measurements, the ZephIR 300 is calibrated to an industry-approved standard, and rigorously tested via IEC-equivalent power-performance measurements. 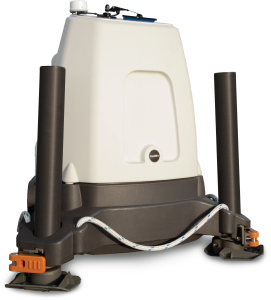 The ZephIR 300 is a rugged device, and is designed to operate autonomously in remote locations. It features a wide operating-temperature range of -40° to +50°C and has an IP67-rated enclosure, sealed against moisture and ingress. The ZephIR 300 is compatible with Campbell Scientific dataloggers, allowing easy integration of meteorological mast data with remote measurements obtained by the ZephIR 300.